Elan Tamarack Apartment Homes for rent in Carlsbad, CA is a beautiful coastal community that offers nearly seven miles of beautiful beaches, picturesque lagoons, and the charm of a European village coupled with world class golf, spas, and shopping. Our community is perfectly located just a few blocks from Tamarack Beach and is walking distance to Carlsbad Village where you will find many restaurants, shopping, entertainment, and local attractions. Quality living coupled with a beautifully landscaped community makes our residents feel right at home. The community offers newly remodeled spacious one and two bedroom apartment homes with fully equipped kitchens, private patio or balcony, and large walk-in closets. The community also boasts lush landscaping, assigned parking, and full-time emergency Maintenance to meet all your maintenance needs. Elan Tamarack Shores welcomes cats and dogs; please see our pet policy as some restrictions may apply. We are conveniently located west of Interstate 5 for easy freeway access and within walking distance to world-class beaches, coastal shopping, and restaurants. Enjoy surfing, sailing, or sunbathing on the sandy nearby beach or savor the fine foods of dozens of local restaurants. Moreover, delight in major retail shopping at the Carlsbad Premium Outlets or visit Southern California's famous attractions including LEGOLAND California, SeaWorld, Disneyland, and the world-famous San Diego Zoo. No matter your tastes or budget, you can experience a wealth of options at every corner. Come and see the unique qualities that provide you with a relaxed coastal atmosphere. 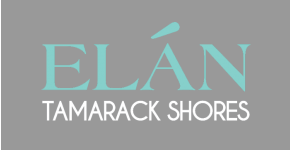 Make your home at Elan Tamarack Shores!